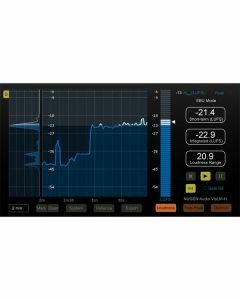 The VisLM-H Loudness Meter Plug-in from NuGen Audio offers a variety of loudness measurement tools that are intended for use in audio mixing and mastering, broadcast, film and more. It is for Mac and Windows and can be used stand-alone or with RTAS, AAX, VST or AU compatible DAW software. The VisLM-H offers true-peak level metering, which is designed to capture spikes in the audio that may even occur between samples. This metering method is intended to deliver a greater degree of accuracy than other forms of metering such as sample peak and QPPM (quasi-peak program meter) which do not detect inter-sample peaks. The VisLM-H can also aid in loudness normalization by allowing for comparisons between loudness and loudness range. This can help in mixing to ease the process of balancing the gain levels between different audio sources such as music, dialog, effects, etc. These measurements can also come in handy in mastering to help determine the appropriate dynamic compression settings. In addition, the VisLM-H also offers momentary loudness metering for real-time level monitoring, short-term metering which shows loudness levels over 3 second windows, and program metering which displays a long-term averaged loudness measurement.